Muddy@rse Girls do the South Downs way – in a Day! 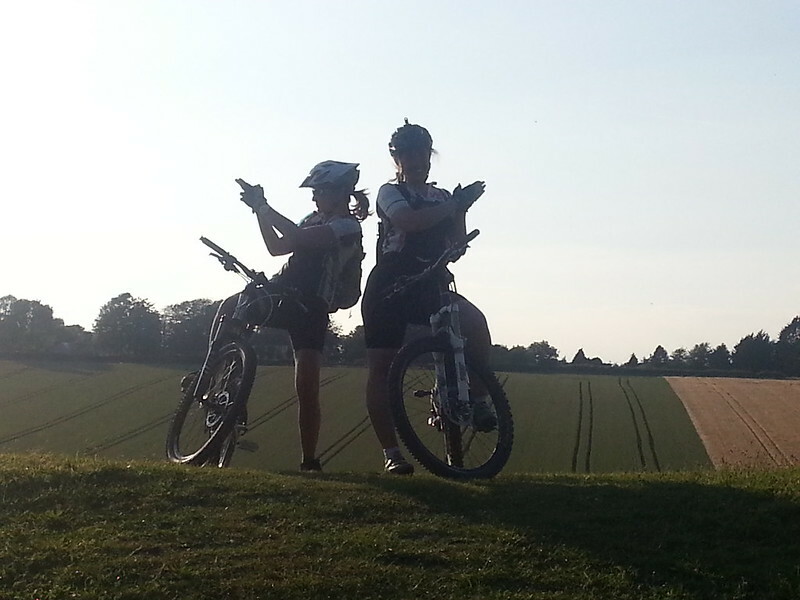 Some of the Muddy@rse girls tell a tale of a crazy idea, training and one amazing long day on the hills…. “I’m just going out for a bit of a bike ride.” That’s what I told myself one sunny morning in Winchester. It was just going to go on for a little longer than usual; one hundred miles and sixteen hours to be precise. That “bit of a bike ride” was of course The South Downs Way which Sally, Jo and I tackled this summer. Motivation is a curious thing. Some people ride the South Downs Way (in a day, or two, or three) to enjoy the countryside; others to beast themselves or to set a new personal best. My motivation was simple – to get fit. It was borne from an idle chat with Sally at the Friston BBQ last year to get us back in training on our bikes. A couple of months later Jo joined our group, and the idle chat had turned into reality. We were going to ride the South Downs Way on the Summer Solstice 2014. So we set ourselves training targets: Jan 20 miles, Feb 30 miles, Mar 40 miles etc. We set up our own Facebook group to share our training, and maybe just a little competitive encouragement . Each week in my diary I gave myself a different challenge: start using Strava, add in some more hills, go on a detox. And some nice ones too like have a back massage. And the training was underway! We had our highs: trips to QE2 park and Afan, dinners together to do some “planning”, and our lows: almost dying after only riding 40 miles in March, being pelted by a gruesome headwind as we summited Itford hill on Ming’s “Upgraded Triple S”. But by far our biggest setback came in the form of Jo’s knee injury which wouldn’t go away and meant she had to curtail her SDW challenge to just the second half of the ride. 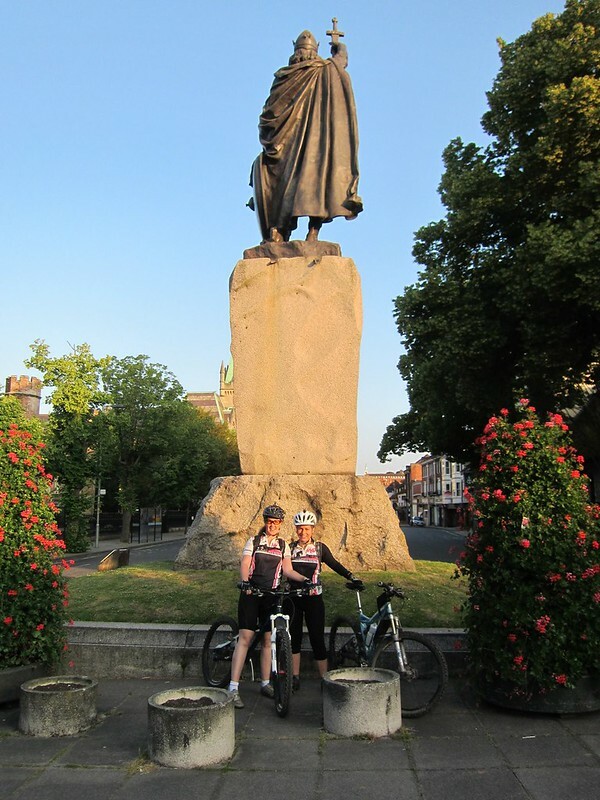 Eventually our big day came and Sally and I set out from Winchester under the watchful gaze of King Alfred at 6 am. Still somewhat apprehensive and keen to preserve our energy, the first 25 miles, in the less well known westerly section, were ridden in almost silence. Ollie provided re-fuelling at QE2 park with bacon butties which were absolute heaven. On route we met a pair of fellow SDW riders. Whilst they were much faster than us, they stopped for more frequent food breaks and at one point lost their way, which meant we kept leap-frogging each other. As a result a healthy bit of banter set in between us as our paths kept crossing. Ah the things you do to pass the time! Jo joined us at Amberley and she was *Mrs Motivator*. What a welcome boost to our flagging spirits as she geed us along the second half. I will never forget her line, “You Girls Are Machines!” as we plodded our way up Truleigh Hill. Guy also joined us for ten miles from Amberley and Michael and Ollie kept popping up on route to ply us with more food and words of encouragement. The miles to Ditchling flew by as a result. There we were met by Rich, Catherine, Ollie and a lovely afternoon tea. I have to confess to almost crying when I saw my family. They were just so full of love and laughter and I was feeling a tad weary by that point. The last leg to Eastbourne was the toughest: the biggest hills, the most tired legs, so it was time to dig in. But one by one the big hills were conquered: Newmarket, Itford, Windover. We started to believe we were going to make it and a sort of giddiness set in. Cue the second unforgettable line of the day, somewhat uncharacteristically from Sally, “Let’s smash this thing!”, and this silly Charlie’s Angels shot. As we descended Windover, the sun began to set and the whole hilltop was bathed in a pink, transcendental light. It was my favourite moment. We tried valiantly not to use our lights up Eastbourne Mile but eventually common sense took over and we switched them on for alongside the golf course and down the new finish to Eastbourne. There we were met by our lovely friends: Lisa, Rick, Ollie, Michael and a bottle of bubbly. High from what we had achieved, the wine was quaffed and stories were shared, before we headed home to for a well-earned rest. Looking back three months later, we definitely met our goal to get fitter. But the day itself was just a means to an end. It was the six months leading up to it that mattered and, as a result, I can now ride to work twice a week without causing total exhaustion. It is the incidental benefits that I probably gained most from though. I learned that you need the support of your family to undertake the amount of training we did and that I owe them my time now to say thank you. I learned that, even when you are really tired, you can keep going. Do not demoralise yourself by thinking about the enormity of what lies ahead, just tackle what is in front of you, one pedal stroke at a time. And finally I gained some awesome friends: from my brilliant co-riders to the unsung heroes – the support crew. Thanks and love to you all. Just got my first off road bike, your journey has inspired me to put in the effort and get used to this very different sort of cycling. Thanks!! Andy on Muddy@rse Girls do the South Downs way – in a Day! Road awareness | Mutterings, Stuff & nonsense | Muddymoles: Mountain biking (MTB) in the Surrey Hills and Mole Valley on Can you pass The Test? Think Pink | Mutterings, Stuff & nonsense | Muddymoles: Mountain biking (MTB) in the Surrey Hills and Mole Valley on Not a Review – Just cos I like looking at em ! Hello world! | bikeitorhikeit on Muddy@rse Girls do the South Downs way – in a Day!